Why Do Therapists Care About W Sitting? W sitting is the opposite of sitting cross-legged or criss cross applesauce sitting. 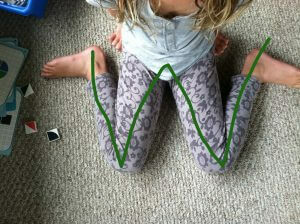 In a W sit, a child’s bottom is on the floor with feet on either side of the hips and toes pointed out. W sitting is common, especially in children with in-toeing, low muscle tone, increased flexibility, or poor core muscles. As therapists, we often caution parents about allowing their children to sit in a W position. But why? Most orthopedists are not concerned about how W sitting affects the joints and alignment of the lower extremities, and there is very little (or no) evidence to suggest that W sitting causes orthopedic issues. So why do we care? Kids will often use the W sit position as a transitional movement, that is, to move into and out of other postures. But when W sitting is used as a sustained posture for playing or floor work, it has the potential to limit development in other areas. This is not to say that no child should sit in this position, but for most typically developing children, sitting in alternative positions will challange the body and allow other systems to mature. Core and Postural Muscles – The W sit position increases a child’s base of support, which in turn requires them to use less muscle activation and energy to maintain balance and an upright position. Pelvic and Spinal Stability – The W sit position is extremely stable so children who sit in this position do not have to learn how to keep their hips and their back from collapsing in positions of instability, such as tall kneeling and standing on 1 foot. Vestibular Activation – W sitting can slow vestibular function and delay the development of equilibrium and protective reflexes and the ability to maintain clear vision during rapid head movements. Stable vision is critical for learning to read and write and for developing fine and gross motor control. Visual Exploration – Because a child’s hips, core, trunk, and head don’t move as much or as often in the W sit position, they aren’t required to move their eyes as much to fixate on their toys and their environment. Delayed Hand Dominance – W sitting limits trunk rotation and inhibits midline crossing. Children who W sit will use their right hand to grab objects on their right and their left hand to grab objects on their left. Poor Protective & Equilibrium Reactions – Kids who W sit do not lose their balance in this position. They do not have to learn how to right their trunk when leaning forward, backward, or to the side, or how to catch themselves when they move too far outside of their base of support and fall. Decreased Body Awareness – Kids who W sit have less awareness of where their body is at in space. Poor Balance & Gross Motor Skills – Because W sitting limits trunk rotation, children do not learn how to weight shift from front to back and side to side, which is a skill needed to maintain balance while running, jumping, skipping, and playing on the playground. Difficulty with the Transition to Kindergarten – Kids are expected to be able to sit on the floor with their legs crossed or upright at a desk in school. Kids that have been W sitting often do not have the strength or skills to be able to successfully maintain a floor sit with legs crossed or an upright trunk position at a desk, let alone be able to appropriately complete school tasks in these positions. If your child frequently W sits, encourage alternative sitting options, including: Cross Legged/Criss Cross Applesauce, Short Kneel (Feet pointed straight back and directly under the bottom), Prone (Lying on the stomach), Long Sit (Sitting on the bottom with legs together and knees straight), or Side Sit (Sitting with bottom on the ground and knees bent with both legs out to the same side).